Harold Gretzner biography provided courtesy of �California Watercolors 1850-1970� By Gordon T. McClelland and Jay T. Last. 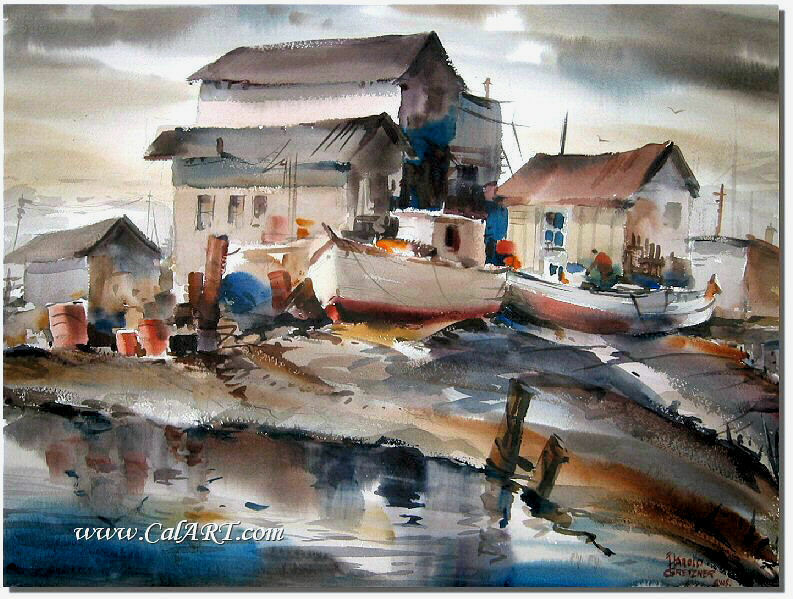 Member: American Watercolor Society, California Water Color Society, West Coast Watercolor Society, Society of Western Artists. Harold Gretzner grew up in the eastern United States and attended art school in Washington, D.C. before moving to California in the 1920s. After settling in the Bay Area, Gretzner studied fine art in Oakland and lithography in San Francisco. For over thirty years, Gretzner followed a routine. In the predawn morning, providing the weather cooperated, he would wake up and drive toward his workplace in San Francisco. Somewhere along the way, he would stop and paint a watercolor, usually depicting a cityscape or harbor view. Harold was exclusively a watercolorist and worked only with transparent paints. His style featured a controlled wet into-wet approach, inspired by his close friend and painting partner, Maurice Logan. Gretzner was a prolific painter and exhibited from the 1930s to the 1970s. He was a member of the Thirteen Watercolorists......extended biography is available in McClellands "California Watercolors" book. Interview with Teckla Gretzner, 1983. Original Watercolor by California Watercolor artist Harold Gretzner A.W.S. Painting measures 22" x 30". It is signed lower right and is in excellent condition.